During the aging process, additional hops flavorings are introduced, providing fine aromatic hop character. 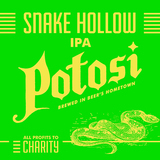 Snake Hollow was the original name of the Potosi Hollow and is a brew with real character. According to tradition, an India Pale Ale requires a plentiful addition of hops during the kettle boil. Subsequently during the aging process, additional hops flavorings are introduced, providing fine aromatic hop character.